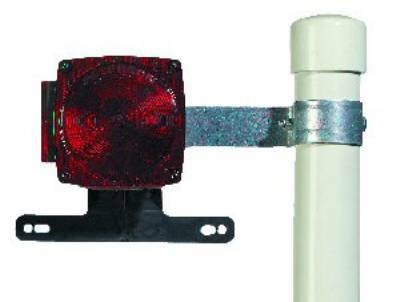 These brackets enable you to mount your boat trailer's tail lights above the trailer and 7-1/2" away from it. This keeps the lights out of the water and away from your boat. Fits 2" Schedule 40 PVC post guide-ons; fits smaller sizes too. Made of pre-galvanized 12 gauge steel. To attach a bracket around the boat guide upright, you will need to drill holes. One end clamps around the post and secures with a bolt. Holes on the other end of the bracket allow for easy mounting of surface-mount lights and leave room for wires.